South Korea’s Deadly New Border Weapon! Because there’s not enough tension already in North and South Korea, a company has now developed what’s being hailed as a ‘super gun’ to help keep an eyeball on the demilitarized zone between the Hatfield/McCoy-style rivalry amongst the two countries. The Super aEgis II is one of the most intimidating weapons ever to back up someone’s ‘No Trespassing’ policies. Featuring a thermal camera, a laser range-finder and can nail and destroy a human-sized target from almost 2 miles away. Because it’s designed as a modular system, the aEgis II’s ‘gun pod’ can be replaced and fitted with various other life-destroying joys like surface-to-air missiles or similar goodies yet to be revealed by its manufacturer. What’s disturbing about the Super aEgis II isn’t that it can destroy a target before the target’s even aware it’s being destroyed…it’s that once Skynet takes over or some 12 year-old hacker decides to add them to their toybox? We’re all in a lot of trouble. Posted in Government, Laser, Military, Robot, Technology, Terminator, Weapon | Comments Off on South Korea’s Deadly New Border Weapon! Military Weaponizes Lightning! Hell Yeah! Here’s your ‘Hell Yeah!’ moment of the week! If you enjoy phrases like “a device that shoots laser bolts” or “50 billion watts of optical power” you may want to continue reading about how the military is weaponizing lightning with a device called the Laser-Induced Plasma Channel, or LIPC. Picatinny Arsenal scientists and engineers in New Jersey have developed a lightning bolt weapon by sending a ridiculously fast laser pulse that basically rips the air apart causing a narrow, electromagnetic channel. Immediately following this moment of scientific awesomeness, a lightning bolt is sent along that channel straight to the unfortunate target. Can’t really argue with that. 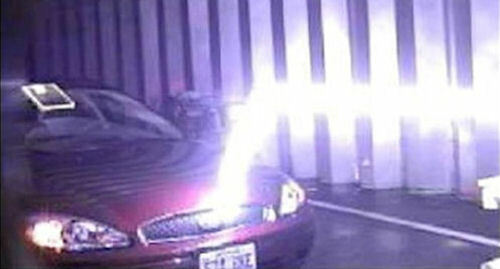 Posted in Awesome, Laser, Military, Weapon | Comments Off on Military Weaponizes Lightning! Hell Yeah! The most powerful Naval force in the history of the world is about to add the most coveted weapon in science fiction. Laser cannons. Although they won’t fire pulse blasts that explode enemy targets, the weaponized lasers can do severe damage to small vessels that might aim to do harm to U.S. ships. 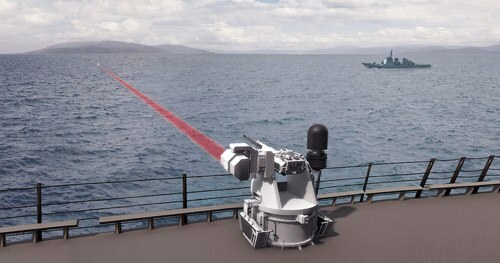 That’s right, the Office of Naval Research is moving forward with a plan to arm ships with solid state lasers capable of taking out small enemy vessels that could be used in swarming attacks or suicide bombing mission against American warships. “We believe it’s time to move forward with solid-state lasers and shift the focus from limited demonstrations to weapon prototype development and related technology advancement,” said Peter Morrison, program officer of the Solid-State Laser Technology Maturation program in a May 8 press release announcing the effort. Check out the link below to find a video of a test laser totally engulfing a boat’s engine in flame. We got a gander of World Scott over at io9 today where he blew up a firecracker inside of a balloon with a laser. Digging through the rest of his YouTube channel, here are two other videos will worth seeing that demonstrate the supreme awesomeness of lasers. Above, watch in awe as the majestic blue laser creates the savory champion of movie treats: popcorn. Each kernel exploding with the knowledge that it was born thanks to an awesome beam of awesomeness. Below, start your morning off right with a cup of joe… headed by GD laser! The best part of waking up is knowing a powerful ray of light brought this brew to an appropriate temperature in your cup. Check out the rest of his channel here. Military had a laser. It tried to shoot down a moving drone. It worked. Lasers are awesome. You hear that drones? Eat it! As is pointed out by our esteemed publisher, the next Chinese UFO that shuts down an airport better watch its six. You are currently browsing the archives for the Laser category.